But none of the cameras show Belgard a moment later, when another officer says, “He’s pointing,” and police open fire. Ten shots can be heard; Belgard’s family has said the autopsy showed he was shot twice in the back. Police first encountered Belgard in a Sugar House parking lot earlier that night, Capt. Lance VanDongen said in a news conference Wednesday. He and his girlfriend were in “a vehicle that had fled from officers in a previous incident the week before,” VanDongen said. It is not clear whether Belgard or his girlfriend were involved in that previous encounter or why police were pursuing the car; police have declined to comment further while West Valley City investigates the shooting. “Hey! Hey! Does he have a gun?” an officer asks the woman, whom police did not identify. Belgard moved to the driver’s seat and backed the car out of the parking space, hitting a police cruiser. He then backs the car around the cruiser, and an officer runs away from the front of the car as it whips around in his direction. Belgard then speeds out of the parking lot, the driver’s side door still open, as the woman yells at him to stop. “Because the driver’s actions posed a significant threat to the public, several officers pursued the vehicle during a chase that ended at 800 N. Sir Philip Drive,” VanDongen said, reading from a prepared statement. Officers can be heard reporting on a radio that Belgard was driving the car up to 90 mph through South Salt Lake and Murray on State Street, with the driver’s side door still open. Officers briefly lost sight of the car as it turned north but tracked it from Interstate 215 to Rose Park. One officer can be heard telling another that Belgard’s girlfriend said he had no gun. “[She] could be lying,” he concludes. A K-9 officer spotted Belgard outside of his friend’s house on a residential street in Rose Park, according to that friend’s sister, Nomi Armijo. Armijo has told The Tribune she was parked outside when Belgard walked toward her family’s house and then cut through the backyard when the K-9 officer appeared. Officers then gathered at Sir Phillip Drive, a block away, to intercept him. Although video footage is grainy, officers can be heard ordering Belgard to show his hands and drop to his knees. “He’s not listening. He’s keeping his hands in his pockets,” says another. “Does someone have less-lethal?” one officer asks, referring to tools and tactics less deadly than a gun, such as stun guns, foam bullets and police dogs. “I’ve got a K-9, I’m coming around,” says the K-9 officer, who is driving a block away. Belgard died that night at the hospital. The day before the shooting, Mike Belgard said, he and his son chatted about police shootings. 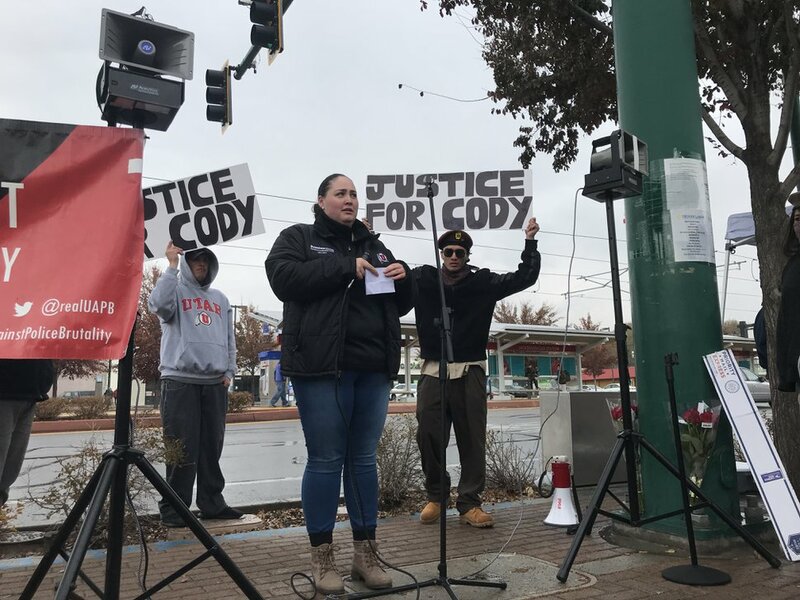 In recent years, Cody Belgard struggled with drug addiction, his family has said. He had faced drug possession and shoplifting charges — for thefts to support his addiction — but never had been accused of any violent crime. Belgard’s behavior at the Sugar House parking lot can be chalked up to fear, Oliveros said. “In situations like this, people get in a fight-or-flight mode,” Oliveros said. “What they’re trying to paint a picture of is he used that vehicle as a weapon. What we know is when they made contact with him [in Rose Park], he no longer had that vehicle in his possession. We know the female [passenger] specifically said he has no weapons, he has no guns. What we also know is that there was a K-9 seconds away. They had him contained, they had a dog on scene. Since Belgard’s death, Utah officers have shot and killed two people, including the driver who struck and killed South Salt Lake police officer David Romrell on Saturday. Police in Utah have shot 26 people so far this year, killing 16 — more than any other year in recent memory. Tribune records of shootings by police go back 15 years.